Blog: Open Office | Avcomm Solutions, Inc.
Do you work in an office where noise levels are similar to those in a crowded football stadium? From colleagues' reality TV discussions to personal phone calls and work-related chatter, noise is all too common in the pervasive open office plan. The open office was designed for collaboration, breaking down walls that could be barriers to information sharing. The unforseen consequences of this office design: a lack of privacy in a noisy, distracting environment. Did you know that each distraction takes 23 minutes to recover from? This translates into thousands of lost hours each year at organizations, at a significant and costly impact. In a new study commissioned by Plantronics, Oxford Economics found that 63 percent of employees say they lack quiet space for focused work, which has a negative effect on their productivity, satisfaction and well-being. •Only 1 percent of employees say they can block out distractions in the office, without taking extra steps. This is a dramatic decline since this study was last done, in 2015; at that time, 20 percent of employees reported that they could block out distractions. •96 percent of executives see employee productivity as critical to their financial performance, yet just 40 percent understand the link between noise, distraction and productivity. •A mere 6 percent of executives report having equipped their office with noise mitigating features. •Employees in the noisiest office environments are more likely to say they may leave their job in the next six months. The open office plan is so pervasive that epidemic noise levels have now been reached worldwide, but is anyone paying attention? Executives, this is your wake-up call! It's time to fix the problem. 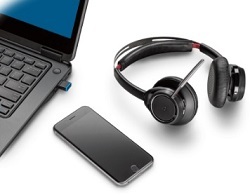 Contact us to learn how to navigate in noisy office environments (Here's a hint: headsets!). 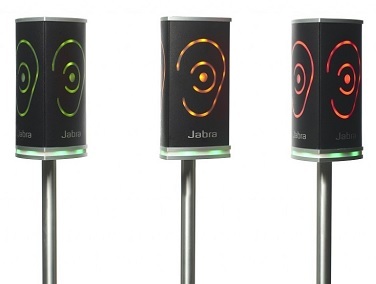 Jabra Noise Guide Increases Office Productivity - At a Glance! Open office arrangements are conducive to collaboration among colleagues; unfortunately, they are also conducive to distracting background noise! 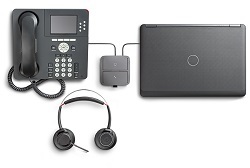 To increase productivity and promote effective sound management, the unique Jabra Noise Guide is a portable device that monitors noise levels in open office environments. See noise levels fall. Feel productivity rise. 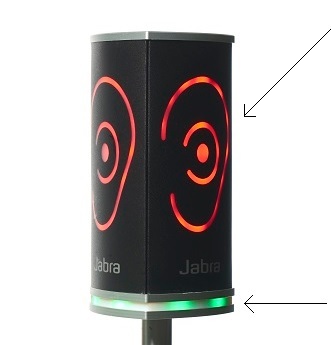 Similar to a traffic light, the Noise Guide provides immediate visual feedback on noise levels. Green: Go! Conversation is at an acceptable level. Yellow: Caution! Noise levels are rising. Red: Stop! Conversation is at an unacceptable level. Customize sensitivity levels for specific needs. It is pre-set for "Noisy Office" but can be easily changed using the SoundEar 3 software (preloaded on the included USB stick) when the Noise Guide is connected to a PC. •The device is lit green when the noise level is below 60 dB. •The device is lit yellow when the noise level ranges from 60 dB to 70 dB. •The device is lit red when the noise level exceeds 70 dB. •The device is lit green when the noise level is below 55 dB. •The device is lit yellow when the noise level ranges from 55 dB to 65 dB. •The device is lit red when the noise level exceeds 65 dB. •The device is lit green when the noise level is below 50 dB. •The device is lit yellow when the noise level ranges from 50 dB to 60 dB. •The device is lit red when the noise level exceeds 60 dB. You can also choose Customize Settings, to tailor the Noise Guide to your specific environment needs. Jabra suggests an average coverage area of 50 sq. feet. Measure underlying noise trends. 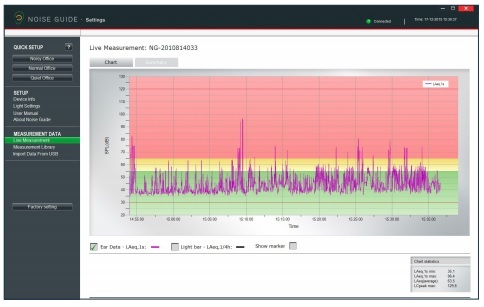 Measure and record daily noise levels over a period of up to three months, to help identify and track problem areas in your office. Download noise data to a PC or a USB stick and analyze it using the special SoundEar 3 software. The Noise Guide provides you with 2 types of measurements, simultaneously. The ear symbol indicates the state of the current noise level while the LED panel at the bottom of the device indicates the average noise level over the past 15 minutes. Ensure you're using the latest software version by clicking on the “Software Update." The "Software Update" button links to the web site where you can find the latest software version. Always remember to update your Noise Guide with latest versions of both software (for your PC) and firmware (for the Noise Guide device). In addition to the Noise Guide, a steel cubicle mount or aluminum table stand, (at a cost of $55.00 each), must be purchased. The portability is a great feature! You can move the Noise Guide between departments, areas, or offices to take advantage of the device. The Table Stand has a table grip that secures the Noise Guide to the desk or table. The cubicle mount rests on top of a divider wall and is clamped into the side. Now through the end of the year, Jabra is offering a FREE Noise Guide with purchase of 35 of any combination of the Evolve 40, 65, and 80 headsets. Contact us to learn more! Want to amp up your output at work and feel energized? Research suggests that listening to upbeat music can bring higher productivity and overall higher feelings of job satisfaction. Give your people the choice of listening to music and watch the work get done! Rather than piping music that may not appeal to everyone over office speakers, perhaps a better choice would be individual music players (PC, Smartphones, Tablets)– with corresponding headsets – to personalize the experience. 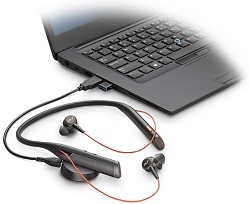 Connecting via USB, Bluetooth, or 3.5mm port, our headsets can handle any set-up. 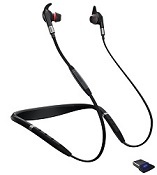 With the same headset, take and make phone calls, and stream your music in between. 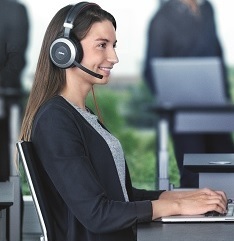 There is no “one size fits all” environment; providing a variety of headsets to choose from will give your staff the chance to choose the one that’s best for them. Perhaps staying within a brand is recommended, to ensure some type of continuity within your organization. The types of music matter, according to this article from The Telegraph. Problem-solving or proofreading? Dance music is where it’s at. This genre resulted in a higher overall accuracy and fastest performance across a variety of work tasks. Boogie on down to the best accuracy you’ve ever experienced – and faster! If you’re working with numbers or extremely detailed information, classical music should be blasting in the background. Spelling errors are also most accurately detected when listening to classical music (12% more!). To keep up your momentum with data entry tasks, pop music is best. Instrumental, ambient music works well for equation solving. The music tempo can affect productivity – a faster tempo may heighten awareness and produce quicker results; a slower tempo can relax and help you focus on tasks. Overall, though, choosing music that you like best to listen to will ensure your good mood, thus raising your productivity. So, if that music is techno, country, screamo, or Gregorian chants, put that record on and groove. 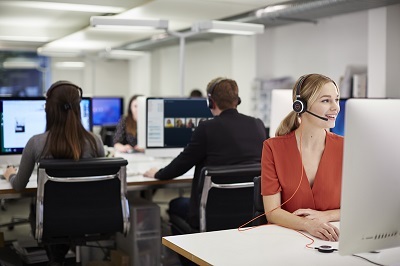 Wearing a headset could be perceived as rude at your organization (depending upon the environment and expectations) – those with public-facing tasks would probably be discouraged from wearing headsets altogether. Taking regular breaks from wearing a headset may be a good idea to encourage camaraderie with co-workers. Click on the Comments tab, above, and tell us your favorite music to listen to while you work! In part 1 of this series about the open office environment, we established that open office work environments are pervasive, distracting and generally not conducive for work that requires concentration – in fact, a Plantronics study found that overall productivity is reduced by 40%. Establish expectations of a quiet office environment. Talk to your manager and ask if this policy can be implemented. 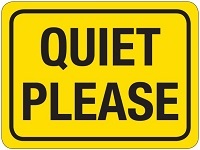 If there is the expectation that the office will be quiet, conversations will be held at low volumes, and those walking through the environment should be quiet, with prolonged conversations held elsewhere. Reminders of this policy can be in the form of signs that are hung up throughout the entire work space. Ear plugs. While this may look slightly ridiculous, sometimes it can be the only way to find true quiet, especially if you have no obligation to being on the phone. You can pick up ear plugs at any discount store for very little cost. Headsets. 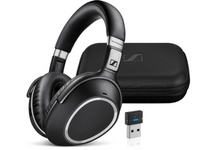 With the variety of active noise cancelling headsets on the market today, and the “cool” factor that wearers of large headphones are enjoying, wearing a headset can provide a solid audial barrier. 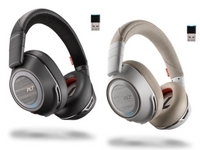 Active noise cancelling quiets ambient sounds by creating frequencies that block the noise at your ear. Not all sounds are blocked; overall, they will be significantly reduced. Headsets also serve a practical purpose in your business environment because you can answer phone calls with them. The headsets are equipped with noise-cancelling microphones so that your caller will hear you, and not your noisy neighbor who laughs a bit too enthusiastically. 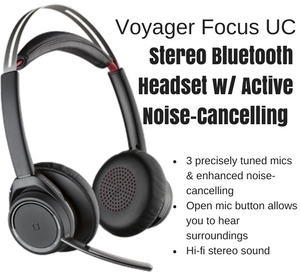 The Voyager Focus UC from Plantronics is a Bluetooth wireless headset that gives you dual ear coverage, an on/off Active Noise Cancelling switch, and an Open Mic button to tune into the environment when you need to. This headset connects seamlessly across PCs (with the included USB adapter), smartphones, and tablets. When you listen to music (delivered with incredible bass and natural midtones) the Focus UC pauses the music whenever you take the headset off, and resumes play when you put it back on. MSRP is $299.95. 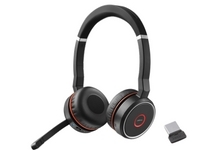 For a corded headset with Active Noise Cancelling, the Jabra Evolve 80 UC has speakers that are built for style and comfort with large leatherette ear cushions, specifically designed to reduce office noise. 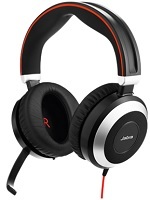 When combined with active noise-cancelling technology, you get maximum protection against office noise. A busy-light indicator on the headset signals user availability to colleagues. 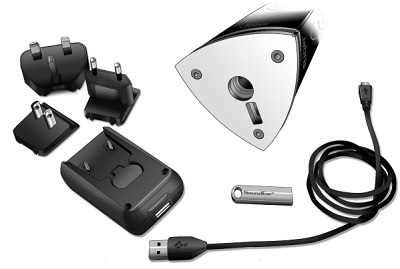 The Evolve 80 connects via 3.5mm and USB for use with smart phones, tablets, and PCs. MSRP is $329.00. Listening to music in your headset can be a great productivity booster. What type of music is best? Studies show that classical music or music without lyrics (such as an Ambient channel on iTunes Radio) can increase productivity, because it provides a mindless distraction. Music with lyrics can be distracting, especially when writing. Or, if music just isn't your thing, "white noise" can be a great alternative. The app Noisli (also available to stream at http://www.noisli.com/ provides 16 audio samples of nature, a coffee shop, a fireplace, white noise, and others). There is a special mix for Productivity, available by selecting that choice. Other options include Rainy Mood or Simply Noise. Ultimately, it is an individual preference and something that can be determined through trial and error until you find your concentration zone. Use busy lights or hang a “Do Not Disturb” sign on your chair or in your office space. Use this judiciously; it may appear that you are not a team player if your “Do Not Disturb” sign is displayed more often than it isn’t. Work from home. If this is a possibility, it may be worth looking into; however, a lack of infrastructure at your workplace might not allow for this solution. Ultimately, we are responsible for how we react in any type of environment. How can we best adapt to this newer concept of open office space? Considering the variety of solutions available to combat open offices, hopefully you’ll find the right solution that helps you along the way. If you have any questions regarding this topic, please reach out to us. We’d love to chat!